Here's one great way you can save money while also saving the planet by getting this Solar LED desk light. 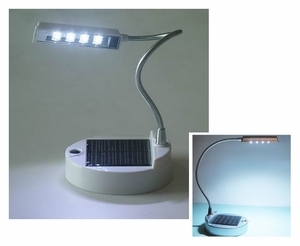 This solar powered LED desk lamp has a built-in rechargable battery that stores solar energy in the day and uses this green renewable energy to power the 4 LEDs at night. Depending on the intensity and duration of the sunlight received, 6 hours of solar charging should provide around 2-3 hours of desk lamp usage. You also have the flexibility to charge the lamp using the convenient USB power connector by plugging it into your laptop or a suitable power adaptor.